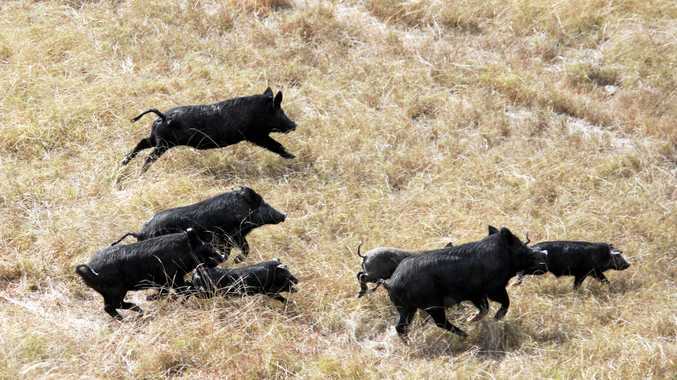 NORTH Burnett landowners are searching for answers to the region's feral pig problem, which they believe is spiralling out of control. The North Burnett Regional Council's feral pig management policy acknowledges the "destructive and dangerous" impact the beasts have on the land, and rapid rate at which they reproduce. Farmers are struggling to control the exploding population, wreaking havoc on crops and threatening the safety of residents. This year, a 15 acre section of Coalstoun Lakes grower Kerry Dove's peanut crop was destroyed by pigs. He said it was hard to tell how much damage had been done until harvest, which could be devastating. "We've certainly got a problem in this community and it's only going to get worse," Mr Dove said. "A few farmers use traps and the young fellas will hunt them but it's not working. "It doesn't even seem to put a dent in the population. Farmers can always resort to fencing, but Mr Dove believes they need to find a long-term solution. "Fencing is a solution - if you can afford it - but it's an expensive exercise and it doesn't fix problem, it just moves it to somewhere else in the district," he said. "Most farmers in the district have had some sort of damage, particularly in remote parts of their property. "At this stage it's left to individual landowners to do what they can." Residents in Kalpowar have reported being chased by the beasts. Some are so concerned they no longer feel safe walking on the roads surrounding the remote township. Others believe there is a danger of pigs on the road causing a crash in poor visibility on foggy winter mornings. "People need to be aware they are out on the roads and if drivers aren't careful in the fog there will be a serious accident," one resident said. Feral pigs are declared an invasive pest under the Biosecurity Act 2014 and Queensland landowners have a legal obligation to manage their presence on their property. The council maintains that a collaborative approach is the only forward. It offers free injection services for meat baits, coordinate targeted baiting programs and hire pig traps for use by members of the community. Environmental services manager, Jeff Miles, is responsible for the North Burnett Regional Council's management of invasive species and said his team endeavours to support landowners wherever possible. "Land protection officers are aware of the reports at Kalpowar and have made contact with them," Mr Miles said. "We rely on input from the public to track their movement and population growth. "The council has traps we hire out, and work with landowners to set them up and capture pigs. "To do that we need landowners' permission and cooperation. "Contact council to arrange a visit from land protection officers and see how we can work together to fix the problem."